I've been reading a lot lately, and on rather diverse subject matter. My usual reading diet is actually a lot more skewed towards the personal blogs, of a largely nontechnical narratorship. This post will be a little of everything, some out of scope for this blog. It's a bit overdue from when I wrote it, but fortunately it's content that lasts. A Sunday a few weeks ago, I stumbled upon GNU Lilypond, a freeware music notation program, and got the sudden idea that I wanted to transcribe Tourdion, a French drinking song from around year 1500, that my local choir sung (among other things) on our week-end trip to Budapest a month ago. Anyway, Lilypond, much like TEX, revolves around a plaintext notation for (music) layout, which it then renders into beautiful postscript, PDFs, SVGs or similar. In theory it is prepared for midi output as well, but I don't think that is implemented yet. It took a few hours, with ample help of its great online documentation, and then I had my score and a great print-quality version (145kb pdf) to keep and to share (and a variant of my own on the tenor voice, which I first misread it as, and kind of grew attached to). The Lilypond notation of the song ended up 4 kilobytes long. In poring through the Lilypond docs, I also encountered Erik Sandberg's Master's Thesis Separating input language and formatter in GNU Lilypond (Uppsala University, Department of Information Technology March 2006 -- 750 kb pdf), which, among other things, had a great geek's guide to (English) music terminology and notation in its appendices. Excellent; just what I needed to brush up a little on my music vocabulary. 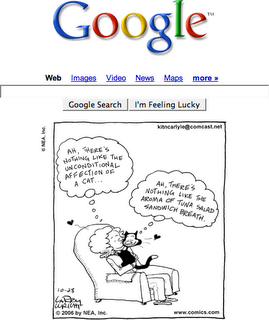 Recall the Google + Dilbert hack I found and refined into an actual minimal comics browser a while ago? Yesterday I figured it might not be too much work tweaking it ever so slightly to cater not just Dilbert strips, but all of the strips published through UnitedMedia at www.comics.com -- about 150 in all (counting the editorials too), including strips like Peanuts, Pearls Before Swine and my recent favourite Kit 'n' Carlyle, pictured on the right. As it turned out, it wasn't; just the matter of adding a smallish configuration interface, and the code runs just as fine on either of the comics pages of the whole site. Site templates is great tech for web scrapers such as this. All it took was an additional 35 or so lines (to a script weighing in around 200 in total). Install the updated script (userscripts.org page); I opted not to change the name even though it isn't strictly a Dilbert browser any more (still is by default until you reconfigure it to something else, though), since changing script names enables people to have both versions installed at the same time which gives me more hairy bug reports than I quite care for. The user interface stays the same; click the left third of a comic to read the previous strip, click the right for the next and click the middle portion to go to the comics.com page for the currently seen strip, for sharing with your friends or similar. (Access keys for these links remain P, N and T; Windows users combine those with Alt, Mac users Control.) While there, you will also notice a "Show this comic at Google" link right next to the comic selection box on top that didn't use to be there before. A summaric post about making my recent macbook more habitable; some ouch!s, and their solutions where I've found one. The bottom left key on the keyboard isn't bound to Control! Page Up and Page Down are both double-hand, double-key bindings! DoubleCommand addresses both issues, letting you bind the fn key to Control and the ⌅ key to fn (so ⌅ plus arrow keys becomes Page Up, Page Down, Home and End). Side note: this does not change the keyboard combinations for the function keys with respect to fn, if you choose to use that combination to access the brightness and volume keys. This is a Good Thing that will hopefully stay the same in future versions of DoubleCommand too (I picked up 1.6.1). Most buttons on my Logitech MX500 mouse don't do anything! Apparently, all Logitech input devices products have a common driver that lets you configure them to do the most extraordinary things; pick up the Logitech Control Center (lcc211.dmg) download from any product on the site and set it up. I'm very happy with my own setup, where I set the mouse wheel to button 3 (lets me paste the clipboard in Carbon Emacs), the Back button to ⌘←, Forward to ⌘→ (makes them work in web browsers, iTunes playlists, and with a bit of extra work, Finder), Quick Switch to F11 (default MacOS X binding for [show] "Desktop"), Cruise Up to F9 (default MacOS X binding for [show] "All windows") and Cruise Down to Switch Application. In Finder, where Back and Forward are by default bound to ⌘[ and ⌘], you can rebind ⌘← and ⌘→ using System Preferences, Keyboard & mouse (the next few tips act out here, so you might as well keep it up). Click the plus button, pick Finder.app, name the Menu title Back and Forward respectively, and feed it the new bindings. You'll have to relaunch Finder to have it recognize the change -- tap ⌥⌘⎋ (that last sign is mac speak for escape, despite not being printed that way on the keyboard) and pick Finder. To assign the F9/F11 key bindings in Logitech Command Center, you need to temporarily disable those bindings in the Keyboard & mouse preferences (below Dock, Exposé and Dashboard), or those commands will be invoked when you try to bind them to your mouse buttons. Re-check them to turn them on again when you're done. Tabbing between web page input fields skips check boxes and selection lists! There is another setting at the bottom of the Keyboard & mouse menu, "Full keyboard access". You want this set to "All controls" mode. How do I get QuickSilver to start automatically? In the System Preferences Accounts view, in the Login Items section, you can add new applications that you don't want to have to wake manually every time you start up. When connected through wifi networks in the wild, how do I securely tunnel through my home stationary machine? This is actually not something I've done in full myself yet, as my stationary machine recently lost name resolution for some reason, but TunnelBlick nicely wraps OpenVPN (just install TunnelBlick and you get both the UI and core application in one installation), and seems like a match in heaven for the task. How do I spawn a Pike on this system? The quickest and easiest way is probably installing Fink, downloading James Tyson's binary mactel deb:s. (In theory they should be buildable from source as well; I didn't quite have the required time / karma combination to get it flying.) Thanks a ton, James! What essential applications do I miss? A really good place to find out about good utilities is I use this, especially if you have close friends with a presence there that might be able to help you out or advocate their tools and give good advice. Browsing through your friendship network or people in general and reading user comments about the applications is rather instructive. Setting up shop for Parallels for managing multiple browser/OS test bed environments in parallel and without spending weeks baby-sitting Windows Update is a whole post on its own. I also have an oustanding list of issues I'd like to find solutions for, which I'm ticking off as I figure them out. Should you have any ideas or solutions, please tell and I'll migrate them to the end of this list.